Case- we've relocated the build to a Node 202 by Fractal Design. It's a nice case especially for 59.99$, but it is hard to build in. Removing the bottom panel was a pain in the *** with those clip style mounts, but once it's off you have to remove other screws, especially on the GPU bracket area to make sure you can fit in monster sized cards like my Vega 56 (305mm). Aside from that currently I have it sitting on my desk with the top panel off. I did order an L9A with the 92mmx25mm fan but I think I'll be trying to make a cutout for the tower cooler and making ventilation for the GPU, since I plan to keep the case horizontal rather than vertical. Vega 56 UV and kept my OC on my Ryzen 5 2600, but the SF450 from Corsair is surprisingly strong, and I've had no issues, no blue screens on both gaming and synthetic benchmarks. Motherboard- I decided to down size to an ITX motherboard so I could potentially port to an sff case and also opens up the bottom of my current case for more fans to create a direct airflow from the bottom to top of case. As I progress the build through its lifetime cycle, I've replaced the stock case fans with 4x SP120 RGB fans from Corsair, as well as the Cryorig H7 Lumi cooler to replace the stock AMD cooler. In addition to these upgrades, I also added in a second SSD from Silicon Power with 512gb of storage. The 256gb is still my boot drive but has changed from housing games to just simple applications like Chrome, Discord, Logitech Game Software, Ngenuity and the likes. I have made the newer larger drive as my dedicated game storage drive instead. CPU temps have dropped of course with the addition of a 4 pipe CPU cooler. The initial addition of the 4 case fans dropped temps by 2-3C so I didn't really see much of an improvement there. After doing a lot of research I ended up with AMD's Ryzen 5 2600 6 core/ 12 thread processor. It is a very strong mid range processor that has strong multithreaded capability and respectable IPC and single core clocks. Since the CPU comes with a stock cooler that is already good, and I have no need for overclocking I did not purchase a third party cooler. However I did purchase some Arctic MX-4 thermal paste and used the Arctic thermal paste cleaner to repaste the stock paste. There is nothing wrong with AMD's stock paste, I just happen to have strong preference for repasting with a different thermal solution. I have no need to spend extra money on a full sized ATX motherboard but wasn't thrilled with paying much more for mini-itx, so matx was the motherboard size and form factor I went for. The motherboard I used was the ASUS b450m a/csm. It has a good amount of everything from I/O to DIMM slots and even has M.2 support and an rgb header. For memory, due to AMDs infinity fabric, the higher clocked the RAM speeds are the better the performance (up until a certain point of diminishing marginal returns). As I see no reason to pay premium for RGB I went with a set of 2x8GB Corsair LPX (black) 3000mhz cl15 RAM. In addition, to being a solid choice, it was also on the QVL for my motherboard. Since most of the games I play are either not resource demanding or mildly CPU bound or well optimized I again went for an AMD offering. The RX 580 8GB currently sits at a unique position (at least in US markets); it is comparable to NVIDIA's GTX 1060 6GB while being priced below it and offers 2GB extra of VRAM for textures, making it a seemingly no brainer choice for any and all mid range PCs. Again, not willing to pay premium for RGB or higher factory clocks, I decided to go with the ASUS Dual Fan RX 580 8gb. After doing a lot of research I found that there are not many matx cases, and the ones that were are either priced low and therefore lacked the aesthetic components and quality of material I was looking for or priced at too high a premium. That is until I found the Corsair 280x (white non rgb ver). Again not willing to shell out extra for RGB, the case I chose is spectacular to say the least. It is spacious but not overbearingly large. It has a cube-ish sort of shape. It includes all the goodies you would expect a premium case to carry and it's solid metal/plastic/tempered glass construction is nothing short of strong. It has great features such as tool-less SSD/HDD trays with easy access to the HDD trays. It has a dual chambered design keeping your main components separate and hidden behind, and has rubber grommets to help hide your cables. It includes 2 stock 120mm fans that have a low hum when on max but barely audible when on low rpms. It includes magnetic dust filters on the top, bottom and front to help keep dust away. I could go on but this isn't a case review. The only gripe, yes I have a gripe, with this case is the GPU/PCIe device bracket. It does not have individual screws. Instead it uses a clasp mounting system that is secured by two thumb screws from the outside. It was difficult in keeping my GPU in place and securing the screws. For my needs since I have no need for potential upgrades in parts until the Q4 2019 or early Q2/Q3 2020 I went with a 550W Seasonic 80+ Gold rated PSU. Seasonic is a very reputable brand with low defect rates and good warranties. It is also a semi modular PSU, which to me makes the most sense since you will always need the 8 and 24 pin CPU/motherboard cables. All in all building was a breeze, and I finished posting, building, installing Windows in less than an hour. Everything is at stock clocks, no overclocking, memory is tuned at rated 3000mhz. I am sure with some tweaking I could eak out a few frames but to me it's not worth the trouble. As far as temperatures are concerned without adding in any additional cooling fans temperatures are fairly reasonable. I have listed the average temperatures on the side panel of this build. I will note that even under a 2-4 hour gaming session the max temperatures recorded by HWInfo was 69C on CPU and 75C on GPU. These are with stock fan curves and settings. 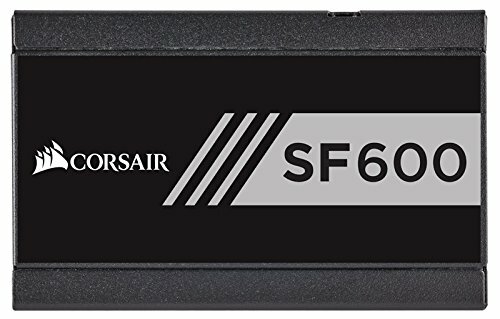 Later once 1TB SSD are cheaper I am considering adding in 1 of them as a backup drive. 3.4 base clock and boosts to 3.9. Thanks to the cooling solutions I have, I never see the boost drop in sustained gaming sessions. Pretty good cooler for its size. I'm sure with an AIO or custom solution I could get lower load temps, but I don't care too much at this point as 55C under sustained load is good enough for me. Only thing I dislike is the QF120 Balance LED fan that it comes with, the LED is nice, but the fan doesn't move as much air as I'd like when silent. I may end up slapping a Noctua fan on there because it's simpler. BIG. It's pretty big so you're going to need a big desk if you run multi monitor setup. I just bought some Corsair fans plan to have them static at all white, all purple or a mix of white and purple. So how was the cooling? I was at each stage for a week or so, I feel like my conclusions aren't arbitrary. I think people saying the Corsair 280x has bad airflow are maybe just parroting what some reviewer said. As you can see the temps from adding in 2 additional fans didn't affect temperatures much meaning the case was already performing average at stock. Adding in the after market cooler did change CPU temps as expected, and more noticeably the gains were seen from when the CPU was under load. Are you able to put the side panel back on after installing the Cryorig CPU cooler? Thanks for the reply! I'm glad to hear it. I'll definitely be investing in one.